Please join us for a community viewing of Seed: The Untold Story taking place after the first Mankato Area Food and Seed Swap. 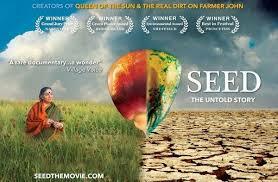 As many irreplaceable seeds near extinction, Seed reveals the harrowing and heartening story of passionate seed keepers as they wage a David and Goliath battle against chemical seed companies, defending a 12,000 year food legacy. Attendance is free of charge though donations to help subsidize the cost of the viewing license is greatly appreciated! Organic popcorn and butter will be served. Please RSVP in advance to plan for seating.